Between long showers and relaxing soaks, bathtubs face significant daily wear and tear. Prone to mildew, mold, and soap scum, acrylic and tile shower walls and tubs need regular cleaning to keep them looking their best. 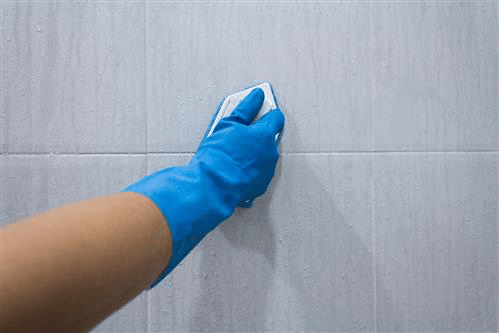 Follow the tips below to learn how to tackle the cleanliness of your bathroom by changing your family’s habits, or by using household cleansers for a much-needed deep clean. The easiest way to keep your bathtub or shower looking good as new is to be diligent about cleanliness. Most of us handle bathroom cleaning on a weekly or even monthly basis, including the maintenance of tubs, sinks, toilets, and more. Instead, vow to take a dedicated approach for your tub alone—if you keep an eye on the shower stall after every use, you’ll spend less time in that area during your usual bathroom overhaul. Ask family members to wipe down the shower with a towel after each use in order to remove excess water or soap residue. You can also use a squeegee on shower walls and doors. White Vinegar: White vinegar is used in common food preparations and recipes, but did you know it’s also an excellent solvent for household applications? Use a half-to-half ratio of vinegar to water in a spray bottle and apply to the surface of the tub. Let sit for about fifteen minutes, and then wipe clean. For heavier stains and dirt, sprinkle baking soda on the tub before spraying. Lemon Juice: Lemon juice has properties similar to household bleach. It makes a safe treatment for rust stains as well. Simply sprinkle the stain with borax, and then rub with a lemon wedge to form a paste. Hydrogen Peroxide: For tough stains, make a paste using one part hydrogen peroxide and two parts baking soda or cream of tartar. Rub the paste into the stain and let stand for thirty minutes. Shower stall kits come in a variety of materials. To prevent damage during cleaning, make sure you know what material your tub is made from before trying a new product or method. Porcelain: This type of tub can handle a bit more wear and tear. Try an abrasive powder and use a scouring pad to remove spots and stains. Enamel: Commercial cleaners are acceptable for cleaning an enamel tub. Take care to avoid bleach or drain cleaners, however. The acids present in these solvents can react with enamel tubs and leave behind brown stains. Acrylic: This material holds up best with frequent cleanings, so keep track of regular maintenance. Always be sure to use soft scrubs or sponges, as abrasive cleaning pads or products with grit can cause scratches and wear on your tub. Once you’ve decided on the right products to use for your tub, it’s time to begin the deep-clean process. First, properly ventilate the bathroom and be sure to protect your hands with a pair of rubber gloves. Before spraying or scrubbing, remove any debris from the shower – such as hair or dust—and then apply your preferred cleanser to work on stains. After the tub and walls are looking clean, be sure to wipe down metal surfaces like showerheads or faucets. For easy to clean bathtub and shower wall enclosures, shop products from American Bath Enterprises, Inc. We’re a family-owned business dedicated to American-made products, and we strive to make installation and renovation easy and affordable. For more information about two-wall and three-wall enclosures designed to meet virtually every kind of bathtub and shower need, call us at (888) 228-4925.